Le Pommier Wine Estate is located in Stellenbosch, 35 min from Cape Town International airport, ideal for business and leisure travelers. Luxurious suites boasting beautiful mountain views. The restaurant serves South African inspired French dishes with award winning wines. Activities include wine tastings, and a petting zoo for children. This intimate Wine estate is a perfect wedding venue for that special day. Visit Le Pommier Wine Estate and experience luxury, elegance and relaxation in the Cape Winelands. 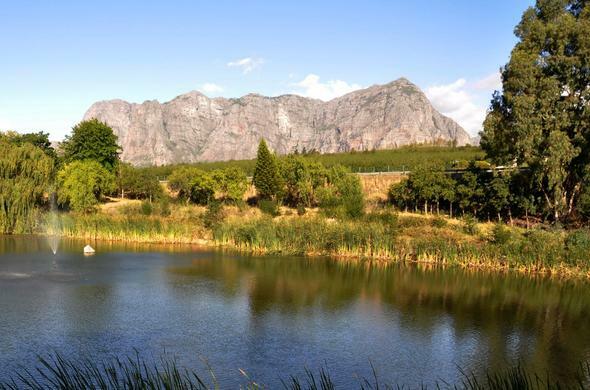 Boasting an unique and authentic Cape Dutch atmosphere, this Stellenbosch wine estate blends harmoniously into its tranquil environment, with the majestic Simonsberg Mountain as the beautiful backdrop. Kids can enjoy an adventurous day at the onsite petting zoo. The sparkling swimming pool offers an excellent break from the heat of the day, complete with comfortable lounges and refreshments. Relax on the viewing deck area that boasts marvelous Banhoek Vally views. A personal chef at the Le Pommier Restaurant will treat you to a sumptuous buffet breakfast to start your morning. Enjoy light lunches on request and in the evening dine elegantly with delicious traditional South African dishes, suitable for the entire family. As the sun sets on the vineyards in the Cape Winelands, retreat to the comfortable private lounge and get cosy in front of the welcoming fireplace before retiring for the night.